News Report: The World´s oldest dog? 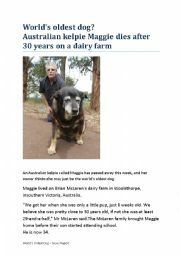 A news report about the death of what is possibly the world´s oldest dog. The article has been simplified for students. Includes a vocabulary exercise and questions to answer about the article. 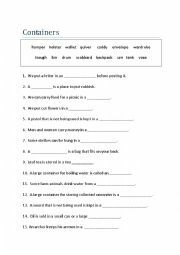 It will assist in broadening a student´s vocabulary with phrases such as ´passed away´ , ´to put an animal down.´ Includes answer key. Fully editable. 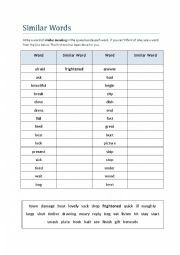 Students are asked to think of, or choose words from a wordbank that are similar in meanining. There are many correct possibilities. It could be a useful dictionary or thesaurus exercise in preparation for more advanced writing, as well as aiding vocabulary development. Fully editable. Includes Answer Key. 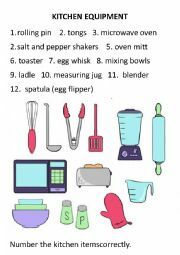 These rhyming word exercises are useful to encourage students to think about the sounds of words and their pronunciation. They also reinforce spelling and vocabulary. Fully editable. 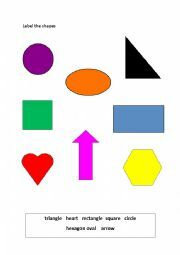 A worksheet to help to learn shapes and colours with a question exercise on page 2. Fully editable. 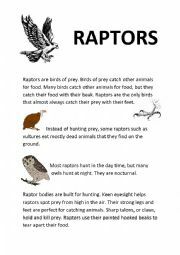 An interesting reading with information about raptors (Birds of prey) to suit elementary to intermediate learners. The reading is followed by an exercise to revise new vocabulary and a wordfind. Fully editable. 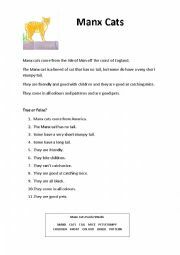 A short reading about the Manx Cat followed by True/False sentences to test comprehension and a word puzzle using vocabulary from the reading. A word list for the puzzle is included, but this could be removed to challenge your students. Fully editable. 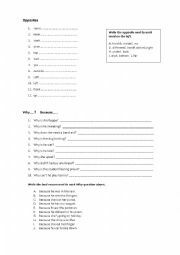 A worksheet to practise vocabulary:opposites and Why...because questions and answers. Suit advanced beginners to low intermediate. Fully editable. Answers included.